When browsing though old books and magazines, I always keep a lookout for easy-to-make, hundred-year-old breakfast recipes. 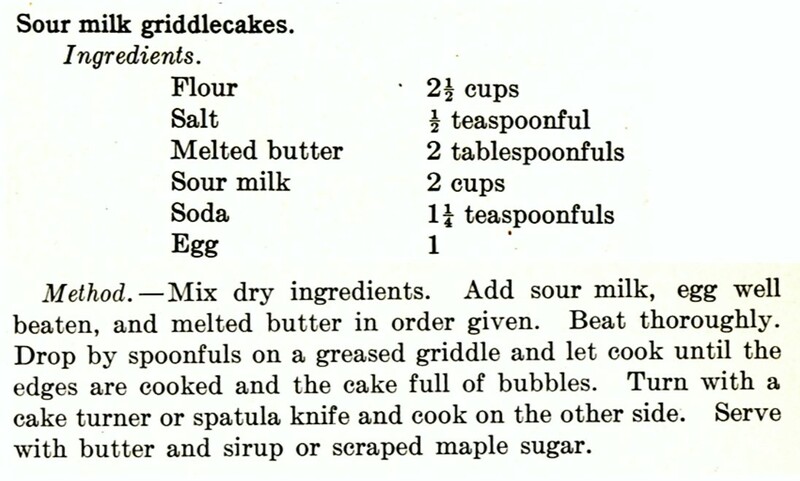 So when I saw a recipe for Sour Milk Griddlecakes in a 1915 home economics textbook, I just had to give it a try. Of course, griddlecakes are just another name for pancakes, but somehow even the name evokes old-fashioned goodness. The Sour Milk Griddlecakes did not disappoint. Unlike most modern recipes, this recipe doesn’t call for any sugar, so the griddlecakes have a very delicate, slightly tangy, neutral flavor that is ready to soak up the goodness of syrups, jams, or other sweet toppings. Put all ingredients in a mixing bowl, beat until smooth. Heat a lightly greased griddle or skillet to a medium temperature, then pour or scoop batter onto the hot surface to make individual pancakes. Cook until the top surface is hot and bubbly, and then flip and cook other side. This recipe is from an era when pasteurized milk was not the norm since it calls for sour milk. In the old days raw milk would sour—but still be good for cooking. Vinegar can be used to “sour” pasteurized milk, so I made that adaptation when modernizing the recipe. Posted on June 12, 2016 June 13, 2016 by SherylPosted in FoodTagged griddle cakes, pancakes, recipe. Good, old pancakes! Always good. 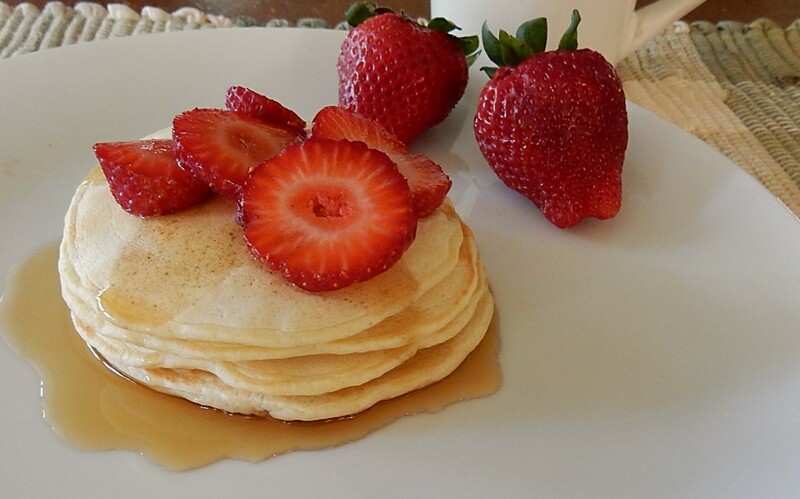 Pancakes are one of my family’s favorite week-end breakfast foods. I like recipes that pour everything in a bowl and mix! That’s a good comparison. They are a little different from the typical modern American pancake. This is a good reminder that sour milk was considered an ingredient for recipes and not just to be thrown away. Based upon what I’ve read, I think that raw milk soured in a way that created a slightly acidic liquid that worked well in recipes. I know these are good! I use sour milk in cooking even use sour cream too when it goes off a bit. Sour cream that’s off is really good in chocolate cake! That was grandmas secret for a moist chocolate cake. mmm. . . the chocolate cake made with sour cream sounds wonderful. Great recipe that you could also make with buttermilk. You’re absolutely right. Buttermilk could be substituted for the sour milk (or the milk and vinegar in my updated recipe). My daughter LOVES pancakes! I’ll have to show this to her! I might even like them, as traditional American pancakes always feel like bricks in my tummy after eating them. These look more my style, thanks! These pancakes are definitely less rich and heavy than most modern pancakes. I think of them more as a muted base for flavorful toppings. mmm. . . They would be perfect with blueberries. wonderful! Pancakes are frequently among our breakfast routing, in fact, I´m having one right now 😉 As an non-native English speaker, what is sour milk? Is it milk at the edge of going bad? buttermilk perhaps? Modern pasteurised milk won’t sour well – it just goes nasty. Do as Sheryl suggests and use vinegar, or as I do, and use lemon juice to lighten it. Or yes, buttermilk works well too. Thank you, Margaret – You’ve described it very well. A hundred years ago people used raw milk that had not been pasteurized. My understanding is that the good bacteria (probiotics) in it would cause the milk to start to ferment and “sour,” but that it was still good. Modern pasteurized milk has been heated and doesn’t contain these probiotics, so it spoils rather than ferments. As Margaret said, adding a little vinegar or lemon juice to our milk creates an ingredient that is very similar to old-fashioned sour milk. Buttermilk is also an excellent substitute for sour milk. They look light and fluffy. They definitely are lighter than most modern pancakes. The other thing that I really noticed about them is that they are less sweet than many pancakes – though I didn’t really miss the sugar since I put a sweet topping on them. This takes me back – my mother used to make these with left over sour milk. She was 16 when war broke out and never lost the habits of being frugal and not wasting anything. They were delicious too! Now I’m going to see if I can find her recipe and compare it with yours. I’m keeping my fingers crossed that you are able to find it. It would to fun to know if this recipe and her recipe are similar. My grandmother made sour milk cookies on the farm and I have tried to recreate them, to no avail. I’m sure the problem is that she was using the sour milk you describe and I was trying to fake it. It can be frustrating when it’s impossible to accurately duplicate some recipes because a needed ingredient has changed across the years. They look delicious! Will definitely be making these. I think that you’ll like them. I agree. . . I also love old church and community cookbooks. Often these books are poorly formatted, but I’ve found some of my favorite recipes in them. People tend to share their best recipes with their friends. How I love griddle cakes – Ooops – pancakes! And what a lovely easy recipe too. It’s interesting how many different names pancakes have. In addition to griddlecakes, I’ve also heard them called flap jacks and hot cakes. how interesting! I love the name and the fact there’s no sugar, pinning to try, thanks! I also liked that the recipe didn’t call for any sugar. I think that you’ll like them. Sounds like a very easy and delicious pancake recipe! Will be trying them next week-end! It’s wonderful to hear that you liked the pancakes. Very lovely–light and delicate looking, like a crepe. They are lighter than many pancakes, but denser than the typical crepe. Mmmm I can just imagine how tasty these were for breakfast. Wow, you cooked up some beautiful griddle cakes. They look delicious. They did turn out nice. I’ve also wondered if there is regional variation in what they are called. I buy buttermilk which is a old fashioned food for us. It is used so many times, and it gives things we cook new flavors. Good idea and can be used so many ways. You are absolutely right. Buttermilk is a great old-time food (and would work wonderfully in this recipe). I should use it more. It’s surprisingly easy to make pancakes from scratch. It’s funny how we’ve all gotten used to using various pancake mixes, when “from scratch” only takes a couple minutes more to make. It sounds like it’s time for some pancakes. 🙂 If you like light and delicate pancakes, I think you’d like this recipe. Delicious! And I’ve heard it’s a great strawberry season this year, time to go picking! These look yummy! I imagine buttermilk would work as well 🙂 Will definitely try them as I love recipes like this with little or no sugar. Buttermilk would work well in this recipe. I also liked that the recipe didn’t call for sugar. I started leaving sugar out of pancakes years and years ago because we always put so much sweet on top of them anyway. These look good. It makes a lot of sense to leave the sugar out. Until I made this recipe, I never really thought about how sugary many pancake recipes are. I love easy pancakes recipes. Yours is a true winner,…Yum Yum.looking. I have vague memories of my mother telling me years ago that vinegar could be used to “sour” milk. Yes, I think vinegar or lemon juice. Vinegar always seemed more risky and less flavorful. Yes, either would work. I’m more likely to have vinegar in the house than lemons, so I generally “sour” milk with it. It’s always worked fine for me. I use apple cider vinegar. Oh my gosh, thank you for this recipe. My grandmother used to make sour milk pancakes and I never learned how. This may now be a Sunday morning norm for my household! It’s wonderful to hear that your grandmother made similar pancakes, and that you are enjoying rediscovering them.